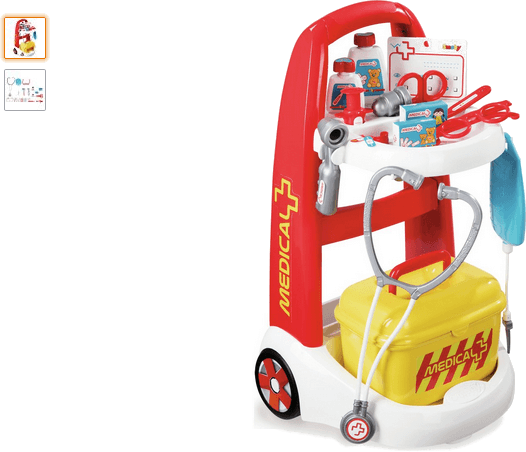 This charming Smoby Medical Rescue Trolley is perfect to stimulate the imagination of little aspiring health professionals. Your most cherished will enjoy taking care of patients and tending to them using a range of realistic accessories which include two (2) flasks, two (2) boxes of bandages, two (2) cards to keep records, a syringe, thermometer, scissors, otoscope, stethoscope, thermometer, a mini hammer to test reflexes and most importantly a pair of glasses so your budding doctor can see the patient! Get money off with April 2019 free Argos voucher codes, see if there's a promo code for the Smoby Medical Rescue Trolley product. Argos may be out of stock of this product. To enhance your shopping experience you may also be redirected to a search results page when you click an outbound link.